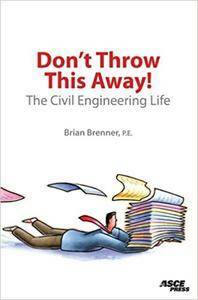 Brian Brenner, "Don't Throw This Away! The Civil Engineering Life"
If you keep your ties for so long, they start to curl up…If you think the Firth of Forth Rail Bridge is a dream vacation destination…If you evaluate infrastructure for your daughter s hamsters…If you one-up your techno-nerd neighbor by offering to network his toilets…you must meet Brian Brenner, a civil engineer s civil engineer. In Don t Throw This Away! The Civil Engineering Life, Brenner reports on what it s like to be a civil engineer in the 21st century: the mindset, the practice, the profession. Equally skilled as a writer and an engineer, Brenner ranges from serious discussions of suburban sprawl, technology run amok, and bridge aesthetics, to comical accounts of packrat habits, quacking moments, and engineering fashion. This entertaining collection of essays displays Brenner s distinctive combination of quirky humor and engineering right stuff.